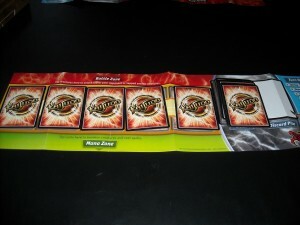 Wizards of the Coast published the TCG by the name of Duel Masters from 2004 to 2006. It was cancelled at the end of 2006, though it still runs in Japan today. Wizards has apparently decided to relaunch the franchise under the name of Kaijudo: Rise of the Duel Masters. This is an interesting decision. Despite using the same battle system, as well a number of cards, this game is not compatible with the original Duel Masters. I’m not sure if fans will be excited that the game is back, or upset that their old cards no longer matter. I wouldn’t want to work for the WotC PR department right about now. Anyways, I love TCGs. I’ve played a number of them over the years, despite the fact that I rarely have friends to play with. I’ve played the big three: Magic, Pokemon, and Yu-Gi-Oh. I’ve also played the WotC Star Wars game and Digimon. On top of that, I have cards for a Mega Man NT Warrior series and a Naruto game. I’ve also played the Marvel Trading Card Game for PSP. Basically, I’ll play/buy any TCG I can get my hands on. At one point, the time between Star Wars battles was a good six years, and M:TG wasn’t that far behind, until a group of my friends randomly got into it thanks to the first Duels of the Planeswalkers. 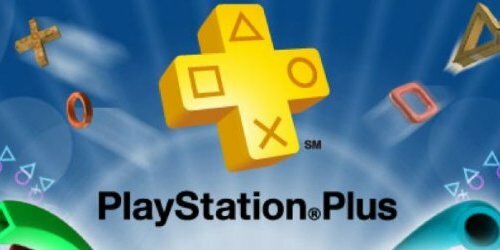 They’ve since grown tired of the game, which is annoying for me, but I’m sure the opportunity to play again will present itself in time. So, as you can imagine, I was pretty excited about getting my hands on Kaijudo. In fact, I couldn’t wait for the cards to arrive by mail, so I headed over to the game’s official website to check out the online version. This proved to be important, as the online version is a single player game geared towards teaching you how to play and getting you used to the cards. I highly recommend that beginners head to the site in order to try it out. Now some of you may read that and think that I’m being silly. Surely the card game will come with instructions, right? Yes, but check them out. If you’re wondering what’s on the back, it’s a poster. Now, I know that not everyone likes big rulebooks, but this seems a tad light compared to what we should be getting. Sure, the game is simple. In fact, you can actually learn to play the game properly from that list. However, I would have greatly preferred if we got something more than this. For example, a glossary of special abilities would be nice. I had a question or two about how Tatsurion’s “Fury Charge” ability worked, but had to look online for answers. I’m also curious as to what happens if a player runs out of cards. Is the game over? Does it continue like normal? Does the discard pile get shuffled into a new library? Any of these options seems viable, but the rulebook doesn’t mention any of them. This is why I recommend that players head online to learn the game. By the way, if you’ve played Duel Monsters before, you don’t need to learn. You already know exactly how this works. Let’s start on the packaging now. The battle decks come grouped together, but actually each get their own box. These boxes are pretty sturdy, and have more than enough room for extra cards. The closing side uses magnets to keep the box from falling open. You can see a picture of one of the boxes on the right to get an idea of their size. I find these to be pretty awesome. They’re far more reliable than the M:TG deck boxes, and more practical than the Yu-Gi-Oh tins I used to have. The darn things look ready made to fit on a bookshelf. I find that darn convenient. The illustrations on the cards are clearly geared towards a younger audience. I don’t need Gatling guns on my dragons in order for them to look cool. Yet such a thing almost seems ordinary for the Kaijudo universe. Another odd point is that many of these illustrations are the same ones found on old Duel Monsters cards. I found this out when watching an instructional video for the older game. I saw one card and realized I had been playing with it not too long ago. Sure, the name was different, as were the abilities. But it was the same picture! Afterwards, I discovered this was the case for more than a few cards. I don’t know if this was something done out of laziness or to pay homage to the original. I’d like to say homage, because anyone could see the similarities/things that are outright the same, and while I didn’t particularly find the art to be at my level, I didn’t find anything as disturbingly juvenile as the Hungry Hamburger card from Yu-Gi-Oh. This was a monster that was summoned with the “Hamburger Recipe” card and was basically a hamburger with teeth coming out of the buns. Raptors with freaking Gatling guns and propellers attached to their bodies almost seems normal compared to that. 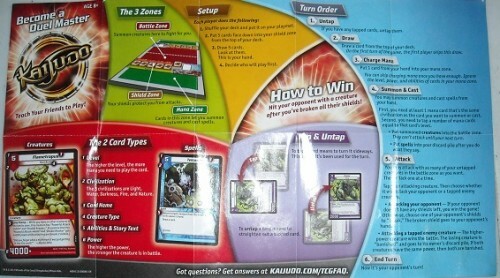 Kaijudo is based around summoning creatures and casting spells in order to land a successful attack on your opponent. Trouble is, there are these pesky shields in the way that must be destroyed first. Each player has five shields, which are represented by five face down cards. When a shield is destroyed, the defending player gets to put that card in his/her hand. The nice thing here is that getting attacked can give you enough of a card advantage to make a comeback. In addition, some cards can be played for free if they were drawn from the shield pool! On each player’s turn, there are five actions that can be taken. First, you draw a card. Secondly, you may place a card from your hand into the mana zone. Like in most cases, mana is used to cast spells and summon creatures. In order to play a card, you must be able to tap mana sources equal to that card’s cost, which is found on the upper left hand corner of the card. There are also five elements, or “civilizations,” to contend with. These are fire, water, nature, darkness, and light. In order to cast a card, you must use at least one mana source with the same civilization. You can place one card in the mana zone each turn, but you aren’t required to. After that, you can play cards until you run out of mana. These can be creatures or spells, but this is the only point during your turn when you can use them. Next is the combat phase. Creatures can attack either a player or a tapped creatures. When attacking, you need merely tap a creature, name your target, and calculate the results. A hit on a shield breaks the shield. A creature battle is won by the highest attack power, with the loser getting sent to the discard pile. Creature can’t attack the turn they were cast. After combat, the turn is passed to the other player. The strategy in the game is subtle, but strong. 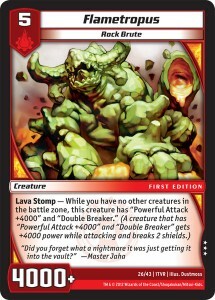 Attacking shield points with reckless abandon might seem like a good idea, but it leaves your creatures vulnerable. Also, since you can’t block an attack in most cases, you need to plan ahead very carefully. There are some creatures that can forcibly block an attack, and these can be lifesavers in times of need. Simply charging your mana can be an exercise in strategy. Do you throw your expensive yet powerful creatures on the stack in order to cast weaker creatures faster, or do you hold off and summon the big guns in the late game? Is playing that spell more useful than playing that creature? These questions, along with the equalizing factor of reaping cards from destroyed shields, makes this one heck of an interesting game. I’m really interested in building my own deck, as I can see all kinds of possibilities here. 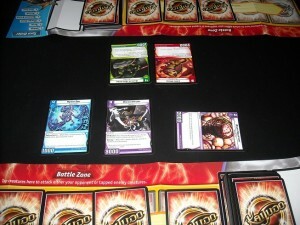 A game of Kaijudo is pretty short, really. I think the longest game I’ve played so far went a little over ten minutes. With fast players, I can see matches going by in a blur. It almost makes my complaint about not knowing what to do if a player runs out of cards moot. If a game goes that many turns, something weird is going on. Come to think of it though, the game doesn’t mention how many copies you can have per deck either. Ugh. Tatsurion’s deck is all about speed and aggression. It has a ton of creatures that can be summoned at any stage of the game. When I played this deck, I found the best strategy was to overwhelm my opponent with sheer numbers. If that failed, I’d summon a higher level monster to tip things back in my balance. The deck also has some cards dedicated to getting extra cards in the mana zone. This speeds up the deck, but usually at the cost of the current turn. For example, the Bronze-Arm Tribe costs four mana to cast, but has a measly one-thousand attack points. This is offset by the ability to place the top card of your library into your mana zone. On the next turn, that’s going to pay dividends one way or the other. Either it will save you from having to put a card in the mana zone, or it will give you two more mana than you had in the previous turn. On the down side, the removal spells give your opponent extra mana, which I do not like. Still, the nature cards combine nicely with the fire cards to create a great aggro deck. Razorkinder’s deck, by comparison, is on a completely different plane of existence. Whereas Tatsurion focuses on strength and speed, this water/darkness deck relies on cunning and timing for the win. My strategy with this deck was to use blockers, of which the former deck has none, to keep the early onslaught at bay while I used cards like Hydro Spy and Spy Mission to draw cards. With the card advantage in my favor, I was able to play exactly what I needed when I needed it. The removal spells were also much more efficient, as they killed off creatures for the same price as the red/green spells, but had no negative side effects. The downside here is that this deck has much fewer attacking creatures. What I liked here is that both of these forty card decks are built to fight each other. Each deck has an answer for everything the other can throw at it. When playing with the red/green deck, I used cards like Overcharge and Little Hissy to target otherwise untouchable blockers. That way, I could save my stuff from punishment by cards like Skeeter Swarmer and Skull Cutter. What I also like about the decks, and the game as a whole, is how flexible it is. Players could easily switch up the decks by taking all of the blue cards from Razorkinder’s deck, and switching them with the green cards from Tatsurion’s. Since all you need to be able to cast a card is at least one other card of the same civilization in the mana zone, this is very easy to work out. The set retails for twenty dollars new, and also comes with two promo cards. These cards have codes that can be used to unlock cards for the online game. The online game is single player only, but the cards certainly came in handy when testing out their associated decks. If I had one real complaint, it’s that the cards themselves are way too flimsy for my tastes. They’re not as bad as Yu-Gi-Oh cards, but I can already see some wear and tear on these. 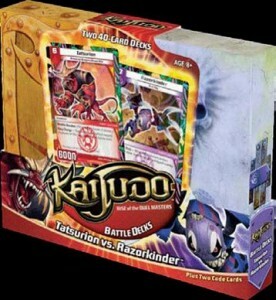 At the moment, this set is all of the Kaijudo cards you can get. I find the game to be an enjoyable experience. It’s also perfect for younger players, as the rules are simple and straightforward. Also, the art was really meant for them. Older players will certainly find the quick pace of games refreshing, as well as the subtle strategy that comes with every draw. I hope to play more Kaijudo when more cards are released. 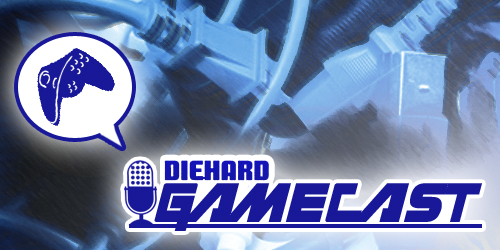 Diehard GameCAST: Episode 70 – Disgaea 5, Until Dawn, Party Hard & more!